Apart from odd areas of under-recording, the Carrion Crow is ubiquitous in the county, and ranked tenth in order of the number of tetrads occupied. Since our First Atlas they have regularly bred on Hilbre. Although they are wary birds, crows can be found in every town and village as well as all rural areas of Cheshire and Wirral. The habitats recorded were 53% in farmland, 30% in woodland, 4% in scrub and 12% in human sites. The abundance map suggests that the regions of highest density include a band from Runcorn to the southwest of Cheshire and another area in southeast Cheshire, while there are fewer birds around Knutsford and Northwich and much of the Wirral peninsula. Carrion Crows’ nests are normally high in a tree, from 10 to 20 metres up, usually firmly supported in the middle of the crown. They are very well constructed, of twigs and fibrous material, filled with earth and mud and lined with wool, feathers and other soft and warm materials, and crows’ nests often last for two years or more and are very important structures for other birds. They are seldom re-used by Carrion Crows but may often form the base for the nest of a raptor, especially Sparrowhawk, Hobby or Buzzard. Fieldworkers found nests in 295 tetrads; the only species of tree reported, in five tetrads, was oak. Most chicks fledge by early June and then accompany their parents for several weeks. Records of recently fledged young provided proof of breeding in 170 tetrads. Their omnivorous diet allows them to survive almost anywhere. 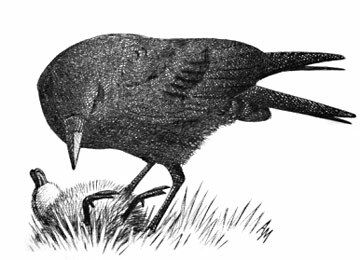 They eat a lot of grain and weed seeds, but meat is a particularly important food item during the breeding season; they take small mammals, usually caught alive, and – true to their name – carrion, crows performing an important early-morning job in clearing road-kill (Coombs 1978). On Hilbre, the crows mostly feed by scavenging on the tide line. The national population has been rising since at least the 1960s (Gregory & Marchant 1996) and the index has shown a 43% rise since 1984. According to the analysis of BBS transects in Cheshire and Wirral, their breeding population in the county in 2004-05 was 30,640 birds (24,080-37,190), an average of 48 birds per tetrad in which they were found. It is not known how that total splits between territory-holding adults and non-breeding flocks, the latter containing one-year-old birds, too young to breed, and subordinate individuals who have not been able to gain a territory. Some of these may be several years old, paired and physiologically ready to breed but, without a territory, are unable to do so (Coombs 1978). The non-breeders are continually testing the territorial birds and pose the biggest threat to Carrion Crows’ successful breeding as they will take eggs or young from the nest if it is not well enough guarded.